The word Anarkali means ‘pomegranate blossom’. As the cut and flare of the suit closely resemble the shape of a pomegranate fruit, hence the name. As Anarkali suits date back to the Mughal period, many courtesans and dancers were seen donning this ethnic outfit during performances. The Anarkali suit gained immense popularity after the Bollywood movie, ‘Mughal-e-Azam,’ where actress Madhubala was seen wearing it. Other movies such as ‘Umaro Jaan’ and ‘Devdas’ where actress Rekha and Madhuri Dixit sported beautiful Anarkali suits. After the Anarkali made its comeback in 2012, since then it has been giving a tough competition to sarees and lehengas. Even today, many Bollywood actresses make public appearances in Anarkali suits. Many fashion designers such as Sabyasachi Mukherjee, Tarun Tahiliani, Anand Kabra, etc. are known to design exquisite ethnic wear especially anarkalis. Anarkali suits are available in many styles such as short Anarkalis, panelled Anarkalis, flared Anarkalis, etc. 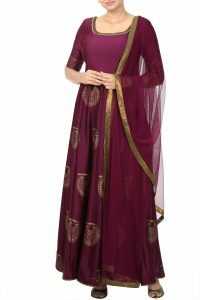 They also come in various colours and material and the best thing about Anarkali suits is that they flatter any body type. You can check out some of the best Anarkali collection at thehlabel.com. Thehlabel is an e-commerce portal that displays a variety of collection right from weddings, festivals, cocktail to parties. The Nakshkaariyan, a collection from thehlabel displays an exclusive ethnic embroidered anarkali suits, digitally printed silk blouses, screen-printed crepe sarees, etc. The collection takes its inspiration from the traditional nath (nose ring) of South India and Maharastra. The nath has been used as a motif and is creatively displayed on garments such as sarees, Anarkalis, kurtis, etc. All garments in this collection are crafted from fine chaderi, net, bemberge, raw-silk and georgette. This festive season if you plan to dress in an anarkali suit, you can check out a few from the Nakshkaariyan collection. The magenta Anarkali suit from this collection is crafted from fine Varanasi chanderi. The nath motif is block printed in gold and scattered all over. The front and back of the neckline is embroidered with gold thread and bead work while the sleeves are screen printed. A soft net magenta dupatta with a gold border is paired with the suit. Wear chandbali earrings, high heels and carry a clutch purse to style up your look. At thehlabel, you can find a fabulous collection of western, ethnic and fusion wear. The label uses the finest pieces of fabrics, innovative patterns and vibrant colours for every garment. Here, every garment is tailored to suit the woman of today. So, in case you are wondering where to shop for your next holiday or festival, all you need to do is log on to thehlabel.com. For more details on western, ethnic and fusion wear log on to www.thehlabel.com.